On 5th September 2015, Richard Guest and I visited the Joseph Cornell exhibition at the Royal Academy of Arts in London. We continued to talk about the show via email for a number of weeks. This is the final part of that electronic conversation – you can read part two here. Richard: It’s a fine line. But I think Cornell is so involved with the process he discovered that the work comes across as warm, genuine and generous. He’s working hard at making poetic images. The evidence is in the work. Everything is considered. To me, Toward the Blue Peninsula: for Emily Dickinson, c. 1953 looks like an embryonic Louise Bourgouis work. I wonder how much of an influence Cornell was on her. There are other works that remind me of other artists. Planet Set, Tête Etoilée, Giuditta Pasta (dédicace) 1950 is strongly reminiscent of Jasper Johns’ Target with Four Faces, 1955 (and we know he was aware of Cornell’s work, because he is a lender to this exhibition), and there was at least one work that made me think of Julian Schnabel’s monumental paintings. Do you think Cornell’s work has had influence beyond the art world (And become a “standard” in the way Sinatra made standards of particular songs)? David: In my professional area I think Cornell has been massively influential, or has at least become iconic. 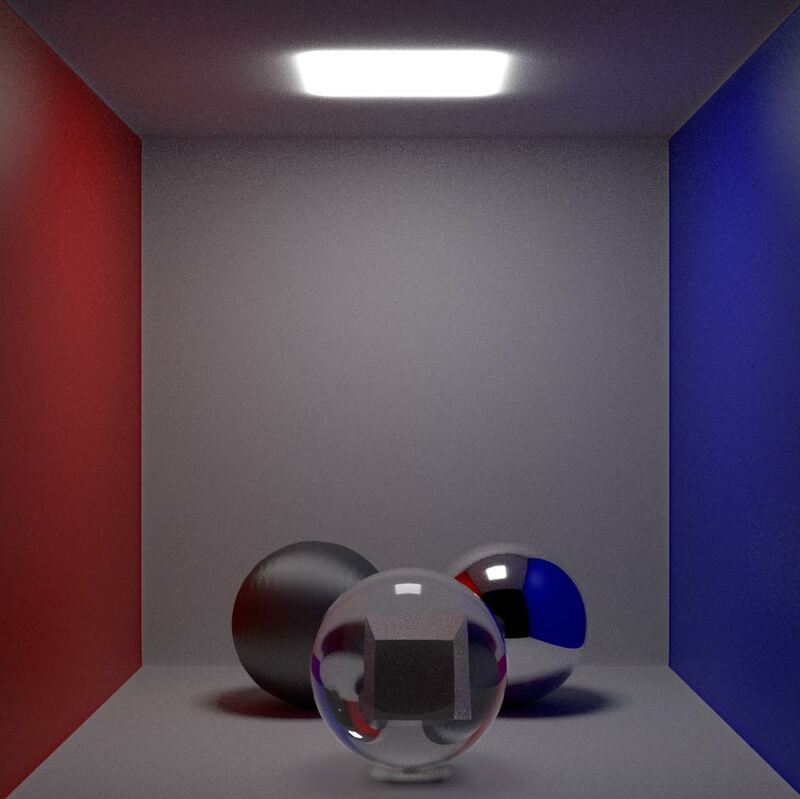 If you Google ‘Cornell Box’ you will see it is a name for a test rendering environment for global illumination and radiosity (diffuse interreflection) environments. Which is to say computer lighting that plausibly imitates real world lighting behaviour by bouncing light rather than just direct illumination. The set up of these (usually just cubes or spheres) objects in a plain white box allows the usually unobserved interplay of surface and light to be seen is a good way to evaluate the behaviour of a render engine with certain known values (of reflection, refraction etc). This is one I made in my favourite renderer, Arnold. I find the comparison with Schnabel a bit beyond me though – his work seems so opposite to Cornell’s. Loud extroverted exhortations to the art world to notice him – Cornell’s quiet poetry is a million miles away, a flower growing unobserved in a shady wood. I think I see a connection with the broken surface of the plates to the world within a world of the boxes – but it really seems a loss of innocence, because I believe Cornell’s motivation was pure (I know that sounds laughable) and I am certain Schnabel s a cynical charlatan. I really like the idea of art ‘standards’. Although they get so mangled it’s only the crazy old Jazzers who can recognise them half the time. That’s us in a couple of years! Richard: There was one work (quite a small one), which unfortunately I can’t remember the name of – it featured a painted abstract shape that was reminiscent of Schnabel’s brushwork and the way he constructs some of his big abstracts. We’ll have to disagree over Schnabel – I think there’s poetry there – it’s Beat poetry, but it’s there (and perhaps I’m naive, but from interviews I’ve seen and read with him he’s anything but cynical). Ha, yes! Hope I make it to be an old jazzer. 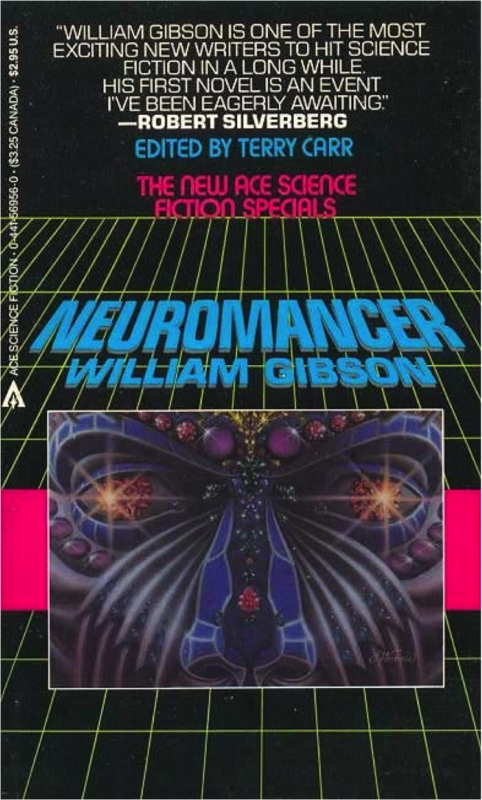 I love it that Cornell’s influence has become part of the greater culture – I’ve just thought of another example: William Gibson’s 1984 novel, Neuromancer (a seminal work in the cyberpunk genre) has Cornell’s work at its heart. David: I am not sure that most good artists would like their followers; just as well that they usually come posthumously. Yet it is inevitable where someone has a really strong style like Cornell that some people who are short of ideas or short of ability to put their ideas into form will pinch the superficial aspects of it. In a way that how your style becomes A Standard, (or a cliché possibly) but it can’t help but water down the impact of the original. I saw the Tetsumi Kudo show at Hauser and Wirth the other day and this piece seemed to me an insult to Cornell, probably unfairly, but it is surely a tribute to Cornell that I thought of him first and not what I was actually looking at. Like using subject matter that is a bit overpowering, a strong influence can overshadow a work sometimes. None of us can avoid them but we need to mix them up carefully, a bit like seasoning food! Richard: Yes, this looks blunt and obvious in comparison with a Cornell box. 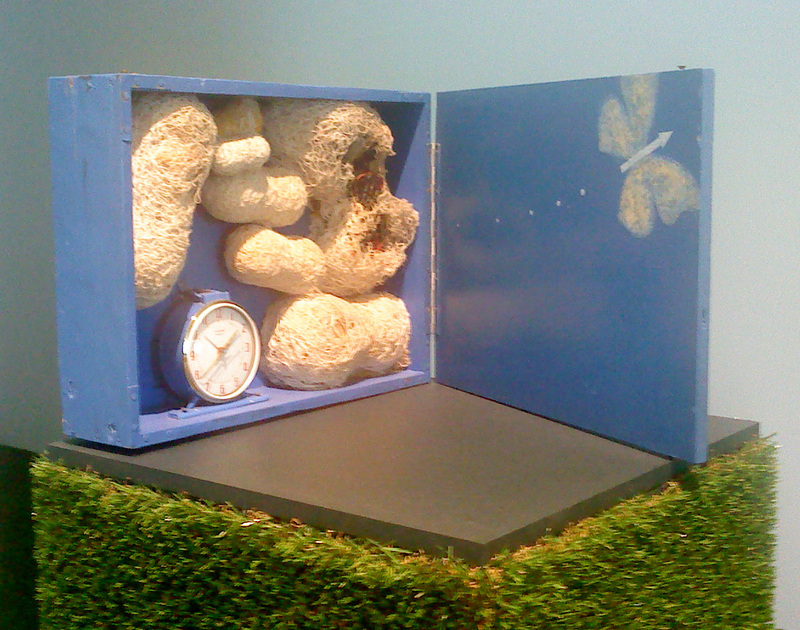 One last thing I’d like to say about Cornell’s work is that it creates its own time. 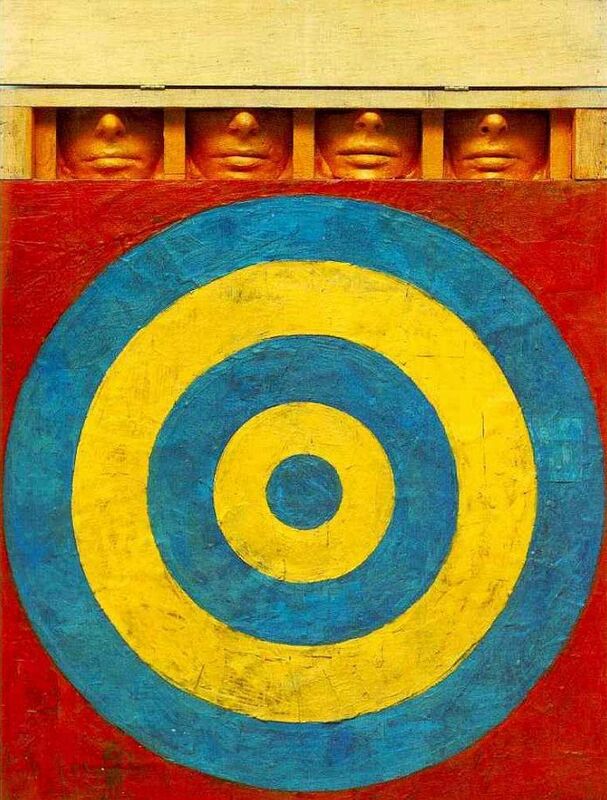 The Kudo work seems to contain a “blink and you’ll miss it” concept, whereas Cornell’s work seems to exist outside the normal pace of life – his boxes draw you in and hold your attention in some kind of suspended space/ time, while the world carries on around you. This entry was posted in American, Modernism, Surrealism and tagged 20thCentury, American, Art, Cornell Box, Joseph Cornell, Modernism, Painting, Sculpture, Surrealism. Standards in art – wow, such a dangerous idea. I’m sure I’d agree with you in many areas, aesthetics-wise, but I’d still be extremely wary of the notion of art standards. (I agree on the last piece being a very poor comparison to Cornell, too, and I like the characterization of Cornell art being is suspended time – that captures it.